19) Will we ever stop greed? Almost wearily, and with more than a hint of despondency, I opened my topic for the day email. At least I had the right intuitive thoughts, which were confirmed when I opened it, although I would much rather have been wrong. Here it is: Why does corruption exist? Can it be stopped? What can bloggers do to help? Another fantastic topic with a positive thought for the day ………….not! Come on guys, give us a break! I had looked back over the years ‘blog a day’ ideas and there were so many that I thought would be fantastic to write about, which is why I signed up to this crazy idea. Please, for tomorrow, give us all something cheerful and uplifting to blog about. PLEASE. Back to todays ‘must do it, only because I said I would, blog’. The very first word that springs to mind has to be greed. In every society it seems that greed is one of the most prevalent emotions/traits, whatever you want to call it, that drives so many people. With corruption, what is even worse, is that sometimes the perpetrator coerces the victim by a form of blackmail … if you don’t pay me, help me, support me, whatever…………. then I won’t …. give you the order, let you pass your exam, assist you in any way. The awful truth is that corruption can take many forms. 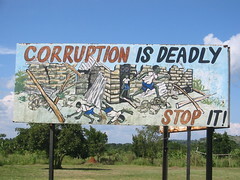 In the classic sense I am sure that most of us think of countries where corruption is rife. Where whole communities are run by people in power who only work because of the gains they can make through their corrupting regimes. More locally, in the UK, I am sure you’ve heard in the news where planning permission has been granted because of some financial gain for the planner from the builder. I believe it is called colloquially, a back hander. It brings to mind so many negative ideas about the people in power. Thats the whole crux of the matter. Power. Give anyone a little power and for some they will use it wisely, for the betterment of others, but the weaker characters, and I do firmly believe they are weak, use that power to gain control and use people to give themselves an advantage. I have, in a small way, personal experience of corruption, and even now after several years, it still makes me angry. I was the financial director of a business for many years, and fortunately I was never asked, and certainly never offered, to give an incentive to any of our customers. We endeavoured to offer the best quality products and service at competitive prices. Our reputation grew and the company did well. However, after twenty years we made the monumental decision to sell our business because of my ill-health. We were advised to build a solid management team who were to stay in place after the sale. We employed a sales director who had previously worked for a large American organisation. We had known him for several years, he had worldwide contacts and an excellent reputation in our industry. Within a few months of his arrival at our company he came to me with a good-sized order from a new customer. I thought nothing of it, and just assumed that our prices and products had obviously been acceptable to the client. However, much to my absolute astonishment, a few days later the sales director came to see me with a claim for a receipt he had. He wanted me to pay him for a personal computer. I was perplexed. Why on earth would I do that? He explained that he had only received the order from the new customer because he had agreed to give him a personal computer! I was stunned and appalled, I immediately said that the customer could take back his order and that we did not work like that. The sales director informed me, in the most condescending manner, that in ‘real’ business, that’s the way the world worked. I stuck to my guns and refused to budge. I refused the order from the client. Every part of me wanted to sack the sales director on the spot. His way of working was against every thread of my being. How could we tolerate such behaviour in our business? Also, I wondered, what had he personally gained from this transaction? I never did find out. I was though stuck in a moral dilemma. At that very time we were in the final stages of selling and the prospective purchasers would not have approved of my terminating this mans employment, almost no matter what the circumstances. They had insisted that in buying the company they would also be employing all the well-trained and valued staff we had, including the well oiled management team. In the final days of the company sale, new employment contracts were issued to key personnel, including the sales director. They had all been aware of the impending sale for several months and we had ensured that the terms of their new contracts were as good, if not better, than their current ones. I was flabbergasted when on the way to a pivotal meeting he rang me on my mobile. He said he would refuse to sign the new contract unless we made it worth his while! To begin with I thought he was joking but it became evident he was not. A massive part of me just wanted to tell him not to bother to sign it and to call off the sale, but it had taken over a year to get to this point, my health was appalling and we were only three days away from completion. Against everything that I had ever believed in we agreed to pay him a substantial amount of money to sign his contract. The company was sold and ironically within three months he had left, to set up his own business. I do wonder how much bribery, corruption and blackmail he has used or been involved with to enable his business to grow. How does he sleep at night? Does he have a conscience? So, how do we, how does anyone, stop it? There are new laws … the anti-bribery laws were put in place in April 2010 in the UK, but I wonder how easy it will be to apply them. How can blogging help with this? Would this be a name and shame type of blog? I can see this could be extremely dangerous in many circumstances and it is also far too easy for people who hold a grudge against someone to use a public blog to cause an innocent person possible irrevocable harm. Sadly, very sadly, I think there always will be greedy people. People who think that they have found a way to make easy money, no matter the cost to others. People who want their own way, to go against laws and legislation by offering to pay officials. Are they here in our lives to give us lessons to overcome? All we can do, even if only in a small way, is to hope that people become enlightened to a new way of life, a way that shows that materialism is not important in the huge scheme of life. Wow. I hadn’t realised that you and the new sales director were so at odds truth sure is stranger than fiction! These topics are certainly stretching both you & your readers.Well done for making the subject real. I agree with what you have posted today. “Will we ever stop greed?” I wonder ………………………………………. Thinking allowed, I reckon being a disciplined self is the first step from falling into the temptations of greed before other structures are in place. Interesting topic …………. Thanks for making me think. !! !